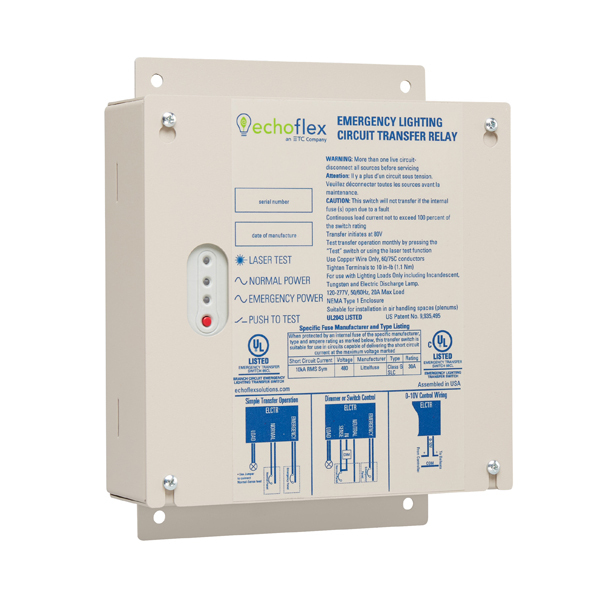 The Emergency Lighting Circuit Transfer Relay (ELCTR) is a branch circuit emergency lighting transfer switch designed to transfer a single lighting circuit up to 20A from one power source to another during a power failure or other emergency situation. UL 1008 Listed for North American emergency lighting applications, the ELCTR’s rugged construction and fail-safe circuitry are essential where life safety is an issue. The National Electric Code (NEC) article 700 clearly defines requirements for devices that can be used for emergency transfer of branch circuits. Most existing products do not meet these fault-current rating and endurance requirements. The ELCTR takes a normal feed, a normal sense, and an emergency feed for a single 20A circuit (120V or 277V) to power a normal/emergency load. When normal power is lost, mechanically held relays transfer both hot and neutral poles while preventing inadvertent connection of normal and emergency circuits. It also features a fire alarm input and a signal disconnect relay for emergency control bypass of 0-10V or DALI fixtures. The ELCTR gives you full Emergency Lighting Transfer Switch (ELTS) functionality and safety at a fraction of the cost of a larger panel.